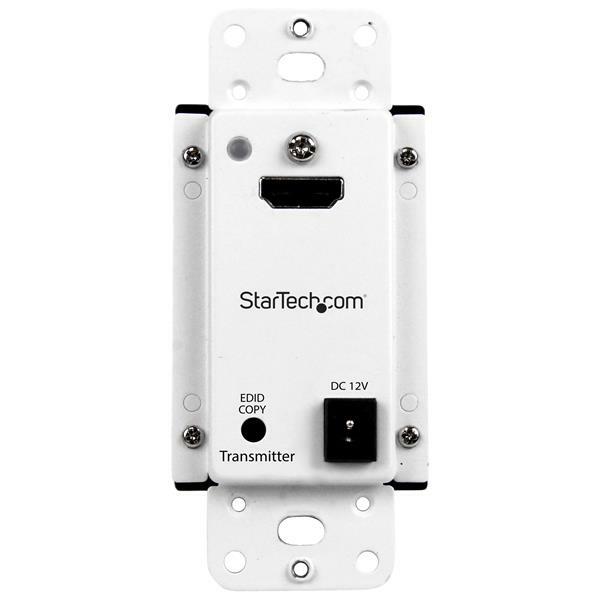 The ST121HDWP HDMI® over CAT5 Extender Wall Plate Kit lets you extend your HDMI audio/video up to 165 feet (50 meters) over Cat5e or Cat6 cabling. For a seamless, professional installation, you can install the included transmitter and receiver units into wall plates, with the added versatility of Power Over Cable enabling both units to be powered by the same single power source. Unlike some video extension systems, the ST121HDWP lets you make use of your existing Cat5 or Cat6 networking cable infrastructure, saving you the time and cost of running expensive proprietary cable. Plus, the kit includes both the extender and receiver, saving you the hassle of buying each component individually. With a sleek finish and wall plate housing, the ST121HDWP is designed with professional installations in mind. Offering a stylish integration into your modern boardroom or classroom, the HDMI extender looks great in any application that requires your equipment and cabling to be concealed from public view. The HDMI extender is great for both short and long-range applications. With a discreet installation the extender is perfect for boardrooms, restaurants, hotels, classrooms and lecture halls. Plus, because the ST121HDWP can extend your signal up to 165 feet (50 meters) over Cat5, you can achieve a total distance of 197ft using HDMI cables up to 5m (16ft) long at both the transmitter and receiver ends -- perfect for long range digital signage applications. 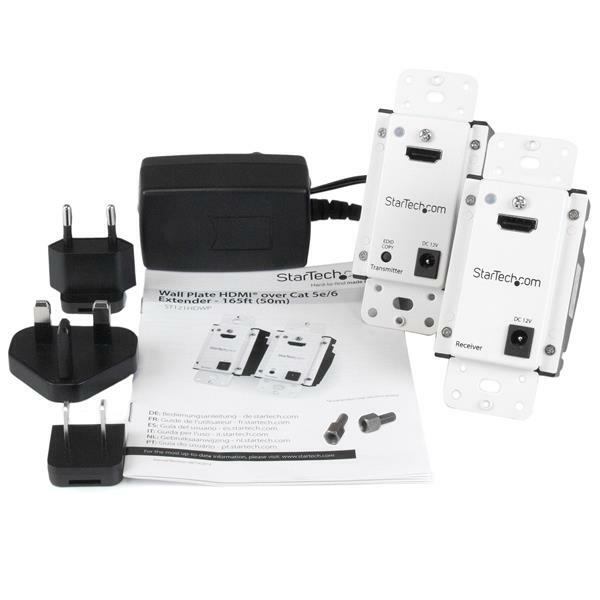 For installation flexibility, the extender offers the unique benefit of an optional external power adapter, giving you the option to power your extender externally for ease of installation, or internally with a 12V DC terminal to discreetly hide your power source. 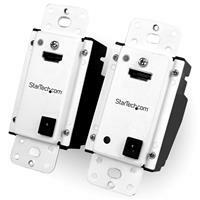 The ST121HDWP is TAA compliant and backed by a StarTech.com 2-year warranty with free lifetime technical support. Can I route my network cables through a router or switch? 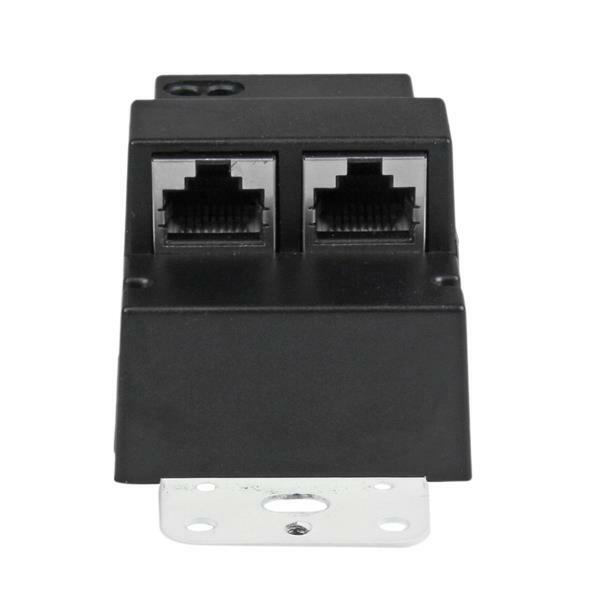 No, this device is designed to be a point-to-point solution using networking cabling only. How do I convert from my video source's VGA, DVI, or DisplayPort output port to this device's HDMI input port? This device has an HDMI input port. If you have a video source that uses another video connection, there are options available to convert the video signal or connection. These options will be outlined below for each video source connection. DVI to HDMI video converters: https://www.startech.com/Cables/Audio-Video/Video-Adapter/HDMI-Cable-Adapters/. DVI to HDMI video cables: https://www.startech.com/Cables/Audio-Video/HDMI/HDMI-to-DVI/. DisplayPort to HDMI passive converters: https://www.startech.com/AV/Displayport-Converters/DP-HDMI/?filter_CONVERTTYPE=Passive. DisplayPort to HDMI active converters: https://www.startech.com/AV/Displayport-Converters/DP-HDMI/?filter_CONVERTTYPE=Active. The converter that you require depends on the type of DisplayPort video source that you are using. For more information about converting DisplayPort video signals, refer to the following FAQ: https://www.startech.com/faq/DisplayPort_Converter_DP_Multi_Mode. How do I set up my video extender? There are a few things you'll want to take care of before you deploy your new video extender in your setup. It’s important to make sure you have everything you will need ahead of time. These items are listed below. It’s also important to test everything in a simplified setup ahead of time to make sure everything works and that you understand how it works. Position your video transmitter near your video source. Connect the video output from your video source to the video transmitter. (Optional) Connect the power adapter to the video transmitter. Note: Not all video extenders require external power, or require external power on both ends. Refer to the manual for more information. Position your video receiver near your display. Connect the video output from your video receiver to your display. (Optional) Connect the power adapter to the video receiver. If using a wired video extender, connect your network cabling between the video transmitter and the video receiver. (Optional) If you are extending anything else supported by your video extender connect those devices to the transmitter and receiver. (Optional) If you are using a wireless extender, there may be a sync button you need to press to pair the transmitter and receiver. Now that you have set up your video extender, you can check that everything is working. You should be able to see your video source's output on the display connected to the video receiver. 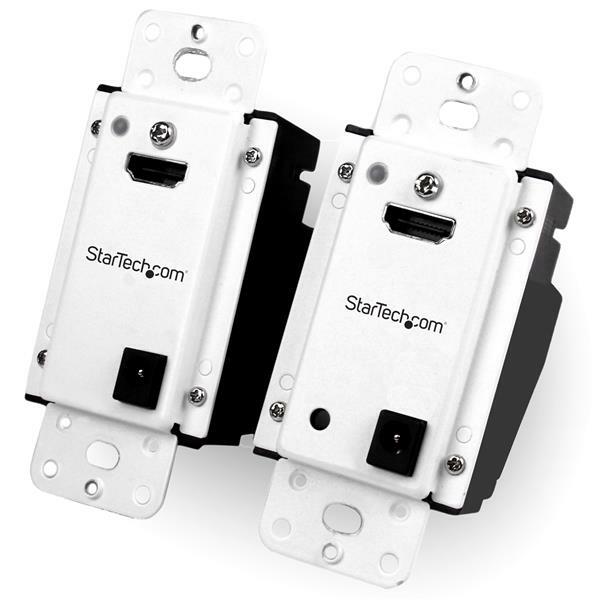 If at this point you have further questions regarding a Startech.com video extender, contact our technical support team for further assistance.